We are thrilled to have received this competitive award, and look forward to working to optimize Juxta for the web. 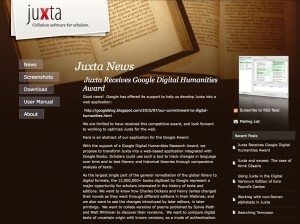 With the support of a Google Digital Humanities Research Award, we propose to transform Juxta into a web-based application integrated with Google Books. Scholars could use such a tool to track changes in language over time and to test literary and historical theories through comparative analysis of texts. As the largest single part of the general remediation of the global library to digital formats, the 12,000,000+ books digitized by Google represent a major opportunity for scholars interested in the history of texts and editions. We want to know how Charles Dickens and Henry James changed their novels as they went through different editions in their lifetimes; and we also want to see the changes introduced by later editors, in later printings. We want to collate versions of poems published by Sylvia Plath and Walt Whitman to discover their revisions. We want to compare digital texts of uncertain origin with known versions, as a mode of authentication. Using Juxta, a scholar can answer these questions and many more. Juxta comes with several kinds of analytic visualizations. The primary collation gives a split frame comparison of a base text with a witness text, along with a display of the digital images from which the base text is derived. Juxta displays a heat map of all textual variants and allows the user to locate all witness variations from the base text. The histogram visualization displays the density of all variation from the base text and serves as a useful finding aid for specific variants. A web based Juxta would be very similar in function to the Juxta desktop application. Scholars could upload texts into a private storage area and compare them against books from the Google Books corpus. The scholar could also embed the collation into their own website (as with Google Maps) with an HTML code snippet that we will generate. Our goal would be to eventually integrate Juxta directly into the Google Books interface, allowing scholars to compare any two books for which they have access to the full text.